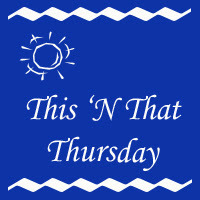 Bringing up Bella: This and That Thursday and Advent Calendar Day 5! Last year, one of the sweetest holiday gifts I received was a post written by Kristine from Rescued Insanity. I had been following Kristine and her adventures with Shiva for a long time on Twitter so her kind words and her most gracious "Loyalty Award" were a balm to my wounded holiday spirit. That post and the social media love that came with it were the brain-child of Pamela from Something Wagging This Way Comes. Her idea of the "Pet Blogger Gift Exchange" where bloggers are paired up to give the gift of social affection to other bloggers is so unique only other bloggers would really get it. And yet this year, I really didn't think I had it in me to commit to one. more. thing. I'm glad I got over it and at the last minute signed up to participate. I was immediately matched with "Our Four-Legged Family" which features the very handsome canine Diggs as well as a beautiful kitty named Isis. I now have the holiday task of getting to know these four-leggers and their family better and couldn't wish for a more lovely way to spend my holiday. If you haven't met them yet, hop on over to say hello. Diggs just had minor surgery and I know his Momma could use some words of commiseration. 'Tis also the season for the Blogville Christmas Card Exchange and we have been so smitten with all the cards and eGreetings we've been receiving. All our cards were sent out earlier this week so hopefully it's raining er, snowing Bella across the globe at this time. For those who didn't join in the fun, don't worry, we'll have lots of out-takes and the cards to share later this month. Finally, today is Day 5 of the Advent Calendar for Dog Lovers. Today is sponsored by Dog Lover Gift Baskets and is absolutely a dream-come-true for any dog lover. You do not want to miss entering this one. Today's giveaway is sponsored by Dog Lover Gift Baskets. You could win dog-centric gift basket for pups & people. Click here to check out the Advent Calendar and enter today's giveaway! I hope your December is busy but joyful. 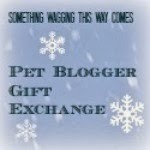 Thanks for joining the Pet Blogger's Gift Exchange and for introducing Our Four Legged Family. I have been enjoying getting to know Diggs and his family. I love getting to know new bloggers and it's so rewarding to give new ones a little exposure. A. It of giving back as it were. Thank you for the link and for your kind words. I don't think I did your moving commitment justice but I am glad I at least made you smile. Now I must go say hello to Diggs! Thanks so much for joining TNT. The gift exchange sounds like fun. This time of year is so crazy for me (evidence that I am just getting here on Monday!). I decided I just could not do it justice but I bet everyone will have a blast with it.